An updated Kia Optima is now on sale with prices starting at £22,260. The updates include a new 1.6-litre diesel engine as well as the introduction of a sporty GT model and various cosmetic tweaks. The 'U3' 1.6-litre CRDi diesel engine replaces the old 1.7-litre unit and has been designed to conform with the latest European emissions standards. Developed at Kia's research and development centre in Germany, the new diesel produces 136PS and 320Nm of torque. Fuel economy for the updated engine ranges from between 61.4mpg and 64.2mpg depending on specification, while it emits between 117 and 122g/km of CO2. Cosmetic upgrades include a new chrome grille, the introduction of a new Runway Red paint colour and redesigned 17-inch and 18-inch alloy wheels. There's a new front bumper design, new LED tail lights and revised front and fog lights. Inside, Kia's updated the steering wheel and added satin-chrome to the centre console. GT-Line S models feature new ambient lighting which can be changed between six different colours. Depending on spec, the facelifted Optima comes with a seven- or eight-inch touchscreen infotainment screen with navigation as well as Apple CarPlay and Android Auto. 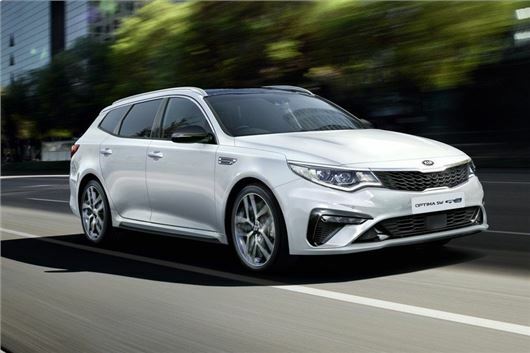 Kia's also launching a new Sportswagon GT variant of its Optima. Sharing a 2.0-litre turbocharged petrol engine with the Stinger, the GT produces 244PS and will hit 60mph in 7.3 seconds. Fuel economy is quoted at 30.7mpg while CO2 emissions are 211g/km. Although the engine is the same as that used in the Stinger (albeit slightly down on power), the Optima GT uses a six-speed automatic gearbox rather than the Stinger's eight-speed transmission. Prices for the sporty Optima start at £33,350, while the 1.6-litre diesel tops out at £31,400 in Sportswagon GT-Line S guise. Dealers are now taking orders for the revised Kia Optima with deliveries expected later in the year.